So I have this skirt from Forever 21 that I got not too long ago and I ABSOLUTELY love it. It was super cheap and I just love the way it fits. It's almost like a full circle skirt (that tutorial is coming soon) but it's a little more fitted at and under the waist. Anyways, I wanted to recreate the skirt because they don't have it in any other colors and I want it more colors. 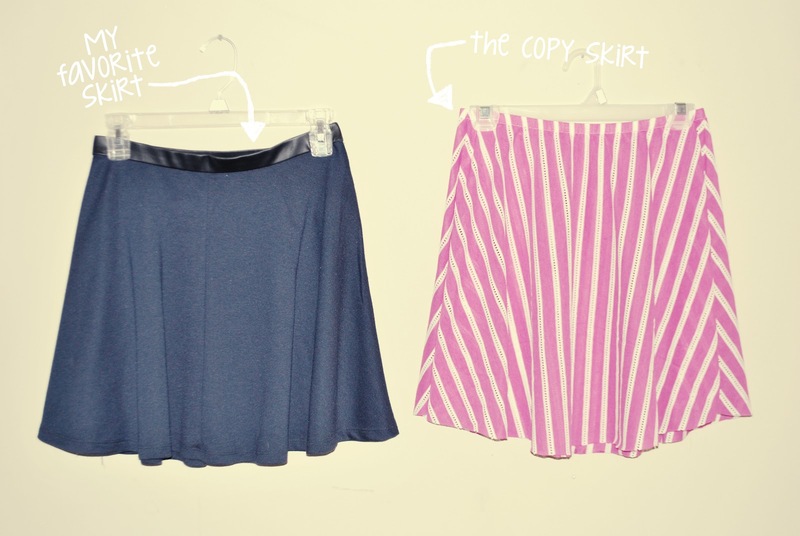 It's super easy to recreate a skirt as simple as this. You can do this with almost any skirt. The original skirt was made out of 4 pieces but I'm going to make mine out of only two pieces. My fabric is folded twice. It's folded once- the way it usually already comes- and then I folded that over again but, just long enough to fit the skirt on. My skirt is folded in half and one edge of it is placed right on the fold. I traced around the skirt about 3/4 inch away from the edge. Cut out along the lines and you should have two pieces. Your two pieces should unfold into this sort of shape. Put the two pieces on top of each other with like sides together. My fabric is basically the same on both sides so it is hard to see the difference through pictures. Sew along the edge on both sides of the skirt. For the waist I folded the edge over and pinned it. I folded it over just a little wider than the elastic I'm using. I used 1/2 inch elastic. Leave an opening so you can insert the elastic. I forgot to take a picture of me putting the elastic in, probably because I was frustrated. Pushing elastic through fabric is always the dumbest thing ever. Put a giant safety pin on the end of the elastic to make it easier to pull through. Once you get it through, sew the elastic together and stitch up the fabric over it. Make sure you never sew over (or onto) the elastic. It will prevent it from stretching. Since I chose a knit fabric, I didn't even bother with hemming the bottom of the skirt so... I'm done! You could hem the bottom if you would like. The finished skirt! You can see more pics of the skirt in this outfit post. I also made a full circle skirt right before I made this skirt so I will be bringing you that tutorial soon! Rather hilariously my favorite skirt is from Forever 21 too! I bought it like 7 years ago and hand wash it (because I'm paranoid it will fall apart). Even my J Crew and Banana Republic wool skirts can't stand up to it. Maybe I should construct a copy! Out of better fabric this time. I like the shape of this skirt and its a great idea to copy it! Love that pink material too! It looks great! One thing to note when sewing on knits, is to use a zig zag stitch because it allows the fabric to stretch without breaking the stitches!! Cool idea! Unfortunately I don't have any remote skill in sewing so I am in awe! That is so cute! And I LOVE the outfit you wore with it!